Josh Constine, you’re my hero. If you’ve been reading my blog (and of course you have been! ), you know that I’ve become increasingly grumpy about this subject. I’ve felt like the old man screaming in an empty room. It seems that everyone has made up their minds that 1) Reach is down, and 2) Facebook is forcing us to pay for ads. My data doesn’t support it (read this or this). In fact, I’m entirely convinced that Reach means very little right now. Everyone is fixated on this number while very few people talk about metrics that matter. Anyway, this blog post isn’t about that. It’s about two things. First, Josh Constine’s awesome mic drop article. Second, some instructions on another “silent killer of Facebook Page Reach” that you need to research. Each news feed post has a drop-down arrow next to it that lets users hide it from their news feed or mark it as spam. Facebook made these controls more visible and easy to use in September. That let people who thought a Page was spammy report it to Facebook or remove it from their feed. At the same time, Facebook updated EdgeRank to more aggressively punish spammy Pages, the way Google updates PageRank occasionally to push down the search result rank of spammy sites. When the change was made, these spam reports went way up. But as Facebook collected this data along with information about Pages you engage with, users began seeing fewer and fewer of this spammy content. As a result, fewer spam reports were made. 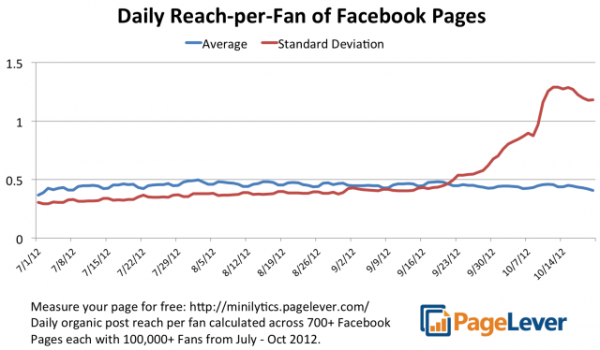 The amount of fans Pages were reaching has stayed relatively stable since July. However, the standard deviation of reach did shoot up. That’s because the few especially spammy Pages and those affected by an increase in news feed competition had their reach drop significantly, while the reach of Pages that almost never get spam reports got a boost. 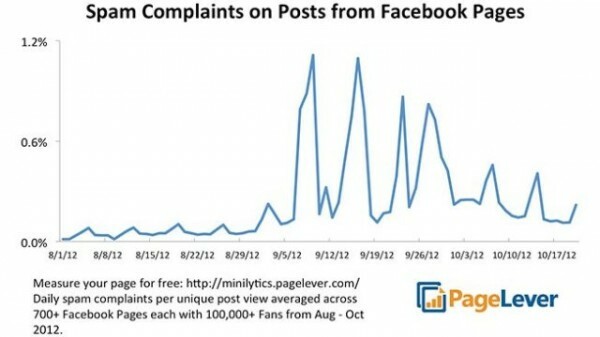 That’s the impact of Facebook’s changes to the spam reporting UI and the EdgeRank algorithm. There’s more to Josh’s article, and I beg you to read it. Very well done. I don’t know about you, but this was my first question. Whether or not you think your Page is spammy is irrelevant. Facebook users will tell you. 2) Within the Insights widget, click See All. 4) Select a period of time lasting five months, leaving it on Page Level Data. That should spit out the number of people who have reported you for spam during the past five months. The number I get is 34, which is about .5% (that’s a half of one percent) of my total Fans. Is that bad? I don’t have a point of reference. But I do know that my numbers haven’t suffered, so I am going to assume it’s acceptable. 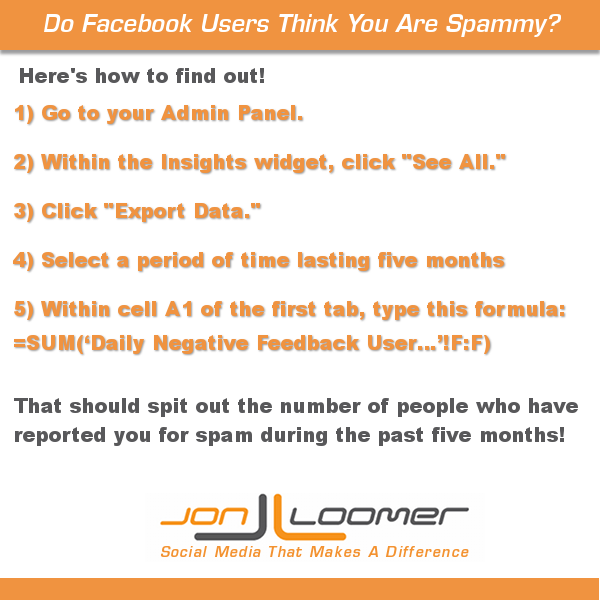 How many people have reported your Page for spam? Are you seeing a corresponding drop in Reach and Engagement? Let me know below!